Is Facebook in Line with the Final Goal of History? I made some comments on Facebook about the importance of using time wisely and making sure it fits in with the glory of God. “The Glory of God” is a good and true way to sum up the final goal of history. In response to my statement there was a question. It went like this, “Is reading Facebook in line with the final goal of history?” This might be a long answer to what could be a short answer, “yes.” I might not have understood the question or what the author was looking for but here are some reasons for why time spent on Facebook is connected with God and His history. Some of you will recognize my Dutch friend who I have tried to bring along to help me. First, the final goal of history is connected with history at every point. I don’t know how it is possible to disconnect the goal of history from anything within time. In every historical moment there is a connection with the goal of all history. Time is not a neutral thing it is a connected thing. It is connected with God’s ultimate view and purpose for time. So while on Facebook I am either relating to God in rebellion, like the first Adam or I relate to Him in submission like the second Adam (Christ). I think many people put things and ideas like these in the area of the “common” or the “natural.” “Common” is a very special thing in God’s world. The things in the common or natural realm are not neutral for they belong and exist in the God created universe. Therefore they are connected with God. Common things like studying for quizzes or looking at flowers are things that take place in the unique and special universe made by the Triune God. Plants and computers do not belong to the chaos universe. Rather, they declare His glory. All in the universe, space and time, are in relation to God their Creator either in rebellion and curse or in redemption and blessing. We live in a personal universe because a Person created all things. Therefore all of time and space is relational or personal. All things are important…whether it is my children’s speech or their kicking a soccer ball around. Our bodies move and run and function because God created them that way. Neither the foot nor the ball belongs to empty space and time. All reality is “Coram Deo” reality. Bugs and tests and computers are connected to the true metaphysical reality in which they exist. God is the final reference point for creation and man at every point. He could not just be the final point for some things. He is related to all or nothing. There is no point in His Creation that is totally man-centered or thing-centered. It cannot be because man did not create the Universe. Furthermore, the fact that we are thinking when we use Facebook declares the glory of God. The fact that we communicate ideas through Facebook does the same. The minds and geniuses that created Facebook declare that there is a God. They were made in the image of God and therefore their minds actually work and work well. The fact that our fingers touch the key-pads because our brain tells them to declares something. Any fact of Creation must be directly related to God because He is the creator and sustainer of the universe in which things like facts are possible. There is rationality involved in Facebook which proves and assumes that rationality exists. This relates to the true God because in the chaos universe rationality could not exist. In the chaos universe that doesn’t exist we wouldn’t be trying to communicate ideas on Facebook. It would have never come into being. So if that were our universe Facebook could not exist. The very fact that Facebook is used proves that there is a God. Any use of time on Facebook is at least in that way related to God. Facebook is something outside of the human and installed on a machine outside of the human knower. In a chaos universe or a ? universe the human knower could know nothing about things outside of himself because it’s not him. How could he know it? How could he even know that it exists and is not a phantom? Apart from the Biblical reality we would not be able to know if when we touch the pads of the keyboard the keyboard is really there or not. If God is not the sustainer and creator of both the subject and the object the subject could not know the object. If we did think we knew something out there apart from God it would be an irrational leap of faith in a dark and chaotic universe that does not exist. The fact that we are talking about Facebook proves that there is a God because it is impossible that a bare unconnected fact can exist. If it did exist it would only be connected to chance or ? and that would make irrationality the mother of us all…which is irrational and therefore pointless to talk about. When we are on Facebook we are admitting a change of information is happening. This can be done only if we already assume that there are foundational principles in place that undergird knowledge. If we really thought that all of reality, including Facebook, was irrational then we probably would not spend time on it. But we do assume that knowledge is possible and this can only be true because there is a God of knowledge behind and undergirding all other types of human knowledge. If this was not assumed even by unbelievers then Mark Zuckerberg would never have attempted to invent Facebook. Facebook, in other words, proves the existence of God. In the chaos universe or in the ? universe or in the all is One universe, Facebook would never have come about. In the “In the beginning God created…” universe, the only universe that exists, Facebook can and has come about. So in this sense, Facebook declares the glory of God. When we use it we are declaring that we know God to exist and that knowledge is possible. Chance or chaos does not give a foundation for knowledge to exist. Everything in the universe, thus, is ultimately related to Him. Things do not drop into God’s universe or appear there without Him knowing about it. We may not understand how it is that God allowed such and such into His universe but one day we can ask. He knows. He will be able to explain it. There is mystery in life but that is explained for the Christian in that God transcends our limited capacities. He knows it even if we do not. That makes sense. The unbeliever on the other hand knows a very limited amount about the universe and history. He has a finite mind and even though he can be very intelligent he can at best know a tiny portion of the created universe. He is shrouded in mystery and yet has no explanation for why mystery exists. He wants the Christian to be shrouded in unexplainable mystery as well so that therefore all can declare independence from anything absolute. People don’t like the absolute and they are absolutely sure we Christians shouldn’t either. Our hearts motivation for being on Facebook is directly related to God as well. What we look at and think about on Facebook as well as how much time we spend on Facebook is all related to God. God will judge all things including my time on Facebook. My heart is related to God so everything I do in time and in my soul is related to God inescapably. Facebook is a part of Creation and what I do with it is a part of providence so it is connected to God in these ways as well. None of this would be true if “all is God (monism)” because then we would not be able to distinguish anything as good or evil thus making the whole point of discussion mute. The whole of Biblical reality must be assumed if we are to be on Facebook honestly. Apart from what the Bible reveals to us about the nature of reality man is at a total loss to know anything or even if knowing is possible. I am glad that smart dudes like Mark Zuckerberg are very inconsistent people. He suppresses the truth but at the same time the truth is inescapable and he has to live in the rational world that God created. He is made in the image of God and therefore he borrows from the Biblical universe and creates pretty useful gadgets. We can thank God that even unbelievers are a mixed bag. So, finally, is reading on Facebook in line with the glory of God? Yes, Facebook proves by its assumption and by its function that this universe is orderly and functional. So Facebook, being in a rational universe as opposed to a vacuum universe makes total sense and should be enjoyed within the proper ethical limits established by God’s Word. Then we can be assured that our use of Facebook will be in line with the ultimate goal of history. A Responsabilidade e sua, Homem! Não seria controverso afirmar que o Brasil (assim como os Estados Unidos) está uma crise cultural. As instituições do casamento e da família estão em desordem. Divórcio, adultério, homossexualidade, confusão de gênero, anarquia sexual e falta de autoridade são apenas alguns dos sintomas que resultam dessa tragédia. Nenhuma sociedade pode ser saudável quando a família, a mais básica das instituições, está em confusão. Há esperança? Sim. Como podemos nos recuperar? Nós certamente não podemos nos recuperar persistindo no mesmo curso. Não podemos culpar as mulheres e as crianças. Não precisamos de mais um filósofo para dar a sua opinião que contradiz o “grande pensador” precedente. Também não podemos continuar pensando que todo homem pode ser um “deus” e fazer o que é certo segundo sua própria mente. Precisamos de um padrão objetivo e autoritativo para nos guiar. Nós temos essa instrução autoritativa na Palavra de Deus. O caminho bíblico para a recuperação é claro. Alcançar os homens. Por quê? Os homens têm o dever e a responsabilidade de defender o casamento e a família. Eles devem ser os pastores da família, e, se os pastores falham, as ovelhas se extraviam. Aonde os homens foram durante esta crise cultural? Assim como o primeiro Adão, eles falharam em cultivar e proteger o que era a sua responsabilidade dada por Deus. Deus colocou o homem no jardim para cultivar e nutrir o jardim, a fim de que ele desse frutos para a glória de Deus (Gn 2.15). Ele deveria ter domínio, como um pequeno senhor, sob o grande Rei de toda a criação. Ele deveria ser o servo do Senhor na terra. Quando um homem “cultiva” ele nutre, edifica, delicadamente guia e governa para a glória de Deus. Quando age essim, ele está começando a voltar à ideia da verdadeira masculinidade. Quando acrescentamos o outro ingrediente de “guardar”, temos a imagem completa. Um homem deve proteger e conservar e continuar a vigiar e manter o que Deus colocou sob seus cuidados. Os homens devem ser líderes-servos de muitas maneiras. Homens são colocados no casamento e hão de ter famílias. Eles têm a responsabilidade diante de Deus de cultivar e guardar o coração e a vida inteira de sua esposa e filhos. É nessas relações que eles têm a responsabilidade de fazer com que o amor a Deus e aos outros seja mantido. Um verdadeiro homem percebe que, quando há problemas em seu casamento e família, ele é o maior responsável por assegurar que eles sejam resolvidos. É uma coisa terrível ser um homem, pois Deus lhe deu uma enorme responsabilidade. Ser um verdadeiro homem é ser alguém responsável diante de Deus. Quando o pecado entrou no mundo, foi a mulher quem havia sido tentada. A quem Deus chamou para assumir a responsabilidade por aquilo? O homem (Gn 3.9). Por quê? O homem havia falhado em cumprir sua responsabilidade como senhor e protetor do jardim. Quando Cristo veio ao mundo, ele viveu exatamente o que Adão falhou em realizar. Ele assumiu plena responsabilidade por sua noiva e sua família. Ele entregou a sua vida para que eles tivessem vida. Este é o retrato mais verdadeiro e fiel da masculinidade espiritual. Infelizmente, a masculinidade não é mais identificada com Cristo. A masculinidade foi manchada e conformada à opinião pública. Ela precisa ser transformada e reformada, conduzida de volta ao padrão definitivo da Palavra de Deus. Não é suficiente fazer cartazes e simplesmente protestar nas ruas. Não é suficiente dizer ao mundo que você está cansado da corrupção. Se você de fato deseja ver o mundo transformado, então torne-se um homem bíblico, um homem que entende o significado da verdadeira masculinidade. Quando falhamos em ser o tipo de homens que devemos ser, é em Cristo que podemos encontrar perdão e restauração. É também nele que aprendemos a nos levantar e a continuar na batalha para sermos líderes-servos responsáveis para a Sua glória e para o bem da humanidade. Há tantos problemas no mundo moderno é difícil até mesmo começar nomeá-los. O mundo secular tem um manual que tenta rotular alguns dos problemas “mentais”. Ele é chamado o Manual Diagnostical e Estatístico de Transtornos Mentais. É quase mil páginas. É a vida mais complicada no mundo moderno? Ou, há um outro problema? Como um pastor as respostas que eu acho deve vir da Palavra de Deus. Essa palavra descreve um grande Deus e nos dá uma grande teologia. Infelizmente, grande parte da igreja de hoje tem um pequeno Deus e uma teologia fraca. Por esta razão, nós corremos para o mundo secular para obter ajuda. Eles dão alívio e conforto através de drogas e e uma dose de auto-estima. Esse não é o tipo de alívio que é oferecido na Bíblia. Jo não tinha drogas e ele definitivamente não encontrou ajuda de conselheiros mundanos. Como é que ele sobreviveu por provações? Ele finalmente chegou cara a cara com seu grande Deus. Ele aprendeu a pensar corretamente sobre Deus e sua vida. Eu acredito que este é certamente o que a igreja evangélica precisa. “O novo evangelho visivelmente não consegue produzir reverência profunda, arrependimento profundo, humildade profunda, espírito de adoração, uma preocupação para a igreja. Porquê? Que possamos voltar ao grande Deus, o grande teologia eo verdadeiro Evangelho, que proclama a Palavra de Deus. There are so many problems in the modern world it is difficult to even start naming them. The secular world has a manual which attempts to label some of the “mental” problems. It is called the Diagnostical and Statistical Manual of Mental Disorders. It is nearly a thousand pages. Is life more complicated in the modern world? Or, is there another problem? As a pastor the answers I find must come from God’s Word. That Word describes a big God and gives us a big theology. Sadly, much of the church today has a small God and a weak theology. For this reason we run to the secular world for help. They give relief and comfort through drugs and a dose of self esteem. That is not the kind of relief that is offered in the Bible. Job had no drugs and he definitely did not find help from worldly counselors. How is it that he survived through trials? He finally came face to face with His big God. He learned to think rightly about God and his life. I believe this is certainly what the evangelical church needs. May we return to the big God, the big theology and the true Gospel which God’s Word proclaims. Ernest, the mortal, is gone. I am sad because even though I knew him for a short while I saw a young man of faith. He was a blessing to have around. He was always willing to help and because of his strength, energy, and attitude his help was appreciated. He wanted to grow and progress in life. He told me that he wanted to become an engineer so he could invent and create. He wanted to build things. He wanted to learn more about His God and His Word. He wanted to be a blessing to his family and see them at peace with God and each other. He wanted to be a true man in this world fighting the battles of unbelief, the world, the flesh and the devil. He wanted to be a man centered around Christ and His gospel. His battling days are over. We lost a good brother, a warrior, a friend. He has met the last enemy of death. In Christ death has been defeated. hasten….” Hasten to the Gospel of Jesus Christ. He would remind you that as he is now you too shall soon be. His message from His King is “We implore you on behalf of Christ, be reconciled to God. For our sake he made him to be sin who knew no sin, so that in him we might become the righteousness of God (2 Cor 5:20-21). 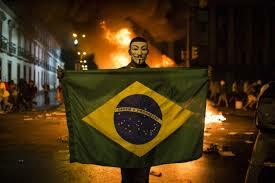 It will not be controversial to say that Brazil (America as well) is in a cultural crisis. The institutions of marriage and family are in disarray. Divorce, adultery, homosexuality, gender confusion, sexual anarchy and a lack of authority are just a few of the symptoms that result from this tragedy. No society can be healthy when the family, the most basic of institutions, is in confusion. Is there hope? Yes. How can we recover? We certainly cannot recover by sticking to the same course. We cannot blame the women and children. We do not need one more philosopher to give his opinion which contradicts the previous “great thinker.” Nor can we continue to think that every man can be a little ‘god’ doing what is right in his own mind. We need an objective, authoritative standard to guide us. We have that authoritative instruction in the Word of God. The Biblical road to recovery is clear. Reach the men. Why? Men have the duty and responsibility to uphold the marriage and the family. They are to be the shepherds of the family and if the shepherds fail the sheep go astray. Where have the men been during this cultural crisis? Just like the first Adam, they have failed to work and protect which is their God-given responsibility. God put man into the garden to grow and nurture the garden so that it would bear fruit to the glory of God (Gen 2:15). He was to have dominion, like a little lord, under the great King of all creation. He was to be the servant of the Lord on the earth. When a man cultivates he nourishes, builds up, gently guides and rules for the glory of God. When he does this he is beginning to return to the idea of true masculinity. When we add the other ingredient of guarding we get the fuller picture. A man is to protect and sustain and continue to watch over and maintain what God has put under his care. Men are to be servant leaders in many ways. Men are put in marriage and will have families. It is the heart/the whole life of their wife and children that they have the responsibility before God to cultivate and guard. It is in these relationships that they have the responsibility to see that love for God and others is maintained. A true man realizes that when there are problems in his marriage and family that he is ultimately responsible to see that they get resolved. It is a fearful thing to be a man because God has given him awesome responsibility. To be a true man is to be a responsible person before God. When sin entered into the world it was the woman who was tempted. Whom did God call to responsibility for this? The man (Gen 3:9). Why? Man failed to fulfill his responsibility as lord and protector of the garden. When Christ came into the world he lived out exactly what Adam failed to do. He took the full responsibility for His bride and family. He laid down His life so that they might have life. This is the truest and best picture of spiritual manliness. Sadly, manhood is no longer identified with Christ. Manhood has been stained and conformed to public opinion. It needs to be transformed and reformed back to the ultimate standard of God’s Word. It is not enough to make banners and merely protest on the streets. It is not enough to tell the world that you are tired of corruption. If you really want to see the world changed then become a Biblical man, a man who knows what true masculinity is about. When we fail to be the kind of men we are supposed to be, it is in Christ where we can find forgiveness and restoration. It is also in Him that we learn to get back up and continue in the battle to be responsible servant leaders for His glory and for the good of humanity. You can support us through PMU by check or PayPal. Tag your gifts for the Leamans.